Once you’re grounded in DiSC®, use these Action Planners to fully utilize what you’ve learned. 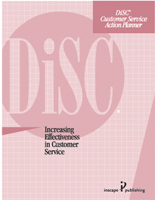 Increase customer satisfaction and service by identifying your customers’ primary DiSC® Dimensions of Behavior and their preferred approach to communication and problem solving. $99 for a set of 10. Please note that these are a special order product and may take more than a week to receive. Contact us with questions.